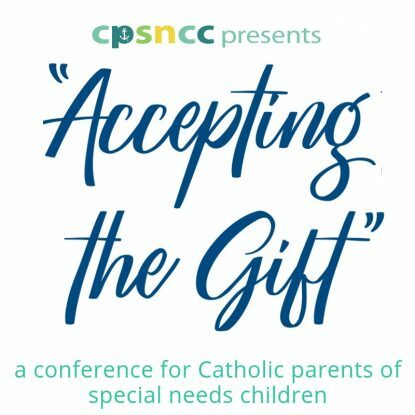 April 27, 2019 9 a.m.
April 27, 2019 5 p.m.
A day designed for Catholic parents of special needs children featuring four talks, continental breakfast and lunch included, plus the opportunity to attend Mass, Adoration, and Confession. Speakers include Ave Marie Press author Mary Lenaburg, talking on learning to trust God and His plan; David Rizzo, author of numerous books on special needs catechesis, will discuss how to prepare your special needs child for his or her sacraments; Kelly Mantoan, chairwoman and writer, will speak on preventing caregiver burnout, both spiritually and physically; and a special panel consisting of Camden, NJ Diocesan Chancellor Rev. James Bartoloma and the National Catholic Bioethics Center, Philadelphia, PA will address tough ethical questions many Catholic special needs parents face that are outside the expertise of their local parish priest. Tickets are $49.95 for in person attendance. Parents who are unable to attend due to distance or caregiver duties can purchase an online attendance ticket for $19.99 and live stream the talks on the day of the event. All attendees will get access to recordings of the days talks, plus access to an online library of additional talks and resources. Tickets can be purchased online through the conference website.